> High-performance low VOC process colors from environmentally friendly raw materials. The diversity and extent of print vehicles continues to challenge commercial and publication printers. And there’s little or no leeway when brand identity is at stake and “the printed piece” is critical to drawing potential buyers’ interest and action. INX continues to lead the way with solutions that deliver crucial output quality, cost-efficiently. This includes exclusive, proprietary ink technology unmatched in the industry, along with ongoing INX Team assistance and technical support for each application and print process. 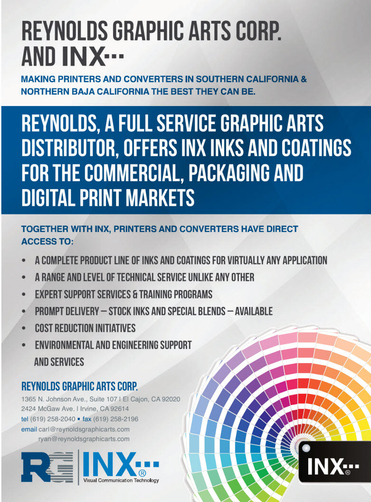 Ink options specially formulated for newsprint reproduction are part of INX’ proprietary ColorTrac™ technology. Unsurpassed reproduction with this technology pleases readers and advertisers alike. A special lineup of exclusive ColorTrac™ inks leads the way in delivering high-speed, high-volume “on-track” output. Ink options include ColorTrac™ SS – an ink system specifically designed for stochastic and other “random” dot screening methods; to reproduce smooth, rich photo-like quality. Outstanding gloss and rub resistance with ProCure™ UV coatings on the full gamut of stocks, tops off each run — cover to cover. Whether you’re running newer, high-speed presses or “high-mileage” equipment with shorter ovens, ColorTrac™ and INXText™ inks deliver consistent quality, run after run. Ink options include ColorTrac™ SS — the only ink system specifically designed for Stochastic and other “random dot” methods, to produce a smooth, rich photo-like look. FormsPro™ is a soy based forms ink system that matches the PANTONE® Basic Colors of the PANTONE® Color Formula Guide. These ASA Soy Seal approved PANTONE® strength colors offer bright colors with excellent printability and mileage. The FormsPro inks provide easier control on ink and water balance which results in excellent press stability. Sheetfed as well as UV options match a full range of substrates (coated or uncoated, gloss or matte) — ideal for work-and-turn operations. Proprietary INX ColorTrac™ technology gives offset users a leg up on any stock, from gloss- and matte-coated paper, label stock and foil/plastic substrate, to directory stock, newsprint and more. ColorTrac™ NS is specially designed to minimize misting and reduce piling on high-speed presses when using lower basis weight stocks. UV users find unexcelled consistency and run stabiliy with INXCure® UV WebXcel™. Exclusive INXCure® blending can further enhance performance. INXVelope™ series and other ink options lead the way in delivering consistent, “blacker blacks” — plus “bottom-line” black … with customer-proven cost savings. Look for superb color output on coated, uncoated and recycled paper, along with rub resistance, gloss and/or other job-specific properties. Specially formulated ColorTrac™ CS (Catalog Series) is first choice for exceptional dot sharpness, rub-resistant covers and UV coatability. And ColorTrac™ SS is the only ink system specially designed for Stochastic and other “random dot” fine-line reproduction. On UV lines, sharp color consistency and stability are INXCure® UV WebXcel™ trademarks, with blending options to match unique needs. From cover stock and high-end coated papers to newsprint, our process-matched inks perform superbly. Advanced EcoPure® HPJ leads a long lineup of Sheetfed inks and INXKote® coatings. A complete line of inks based on ColorTrac™ technology delivers unsurpassed Web Offset quality. And INXCure® UVXcel™, Fusion® UV hybrid and other inks match-up with a variety of UV and water-based coatings for UV users.